1. 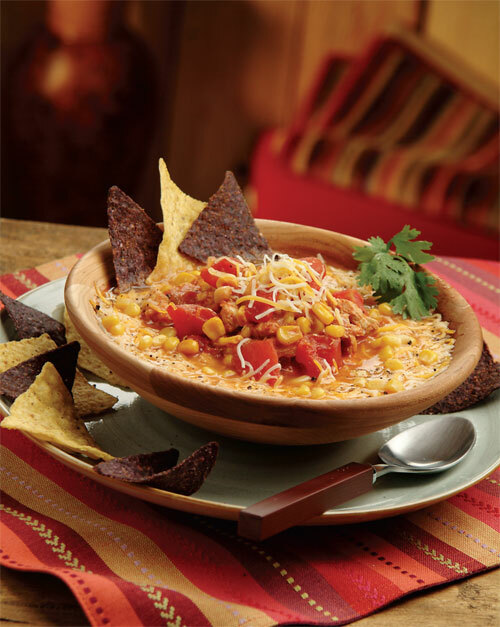 In 4-quart slow cooker, combine all ingredients except tortillas, cheese, cilantro and chips. Cover and cook on high 4 hours, stirring occasionally. Remove and discard bay leaf. 2. Meanwhile, preheat oven to 375°. Stack tortillas and use a pizza wheel to cut into 1/2-inch strips. Place strips on rimmed baking pan. Bake 5 minutes; stir strips and bake 5 minutes longer or until crisp. Ladle soup into bowls. Sprinkle each with cheese and tortilla strips. Serve garnished with cilantro along with tortilla chips, if desired.